How can you tell if a household is on vacation from smart meter data? Easily, just take a look and it’s pretty clear. But what if there are hundreds of households? Thousands? Millions? 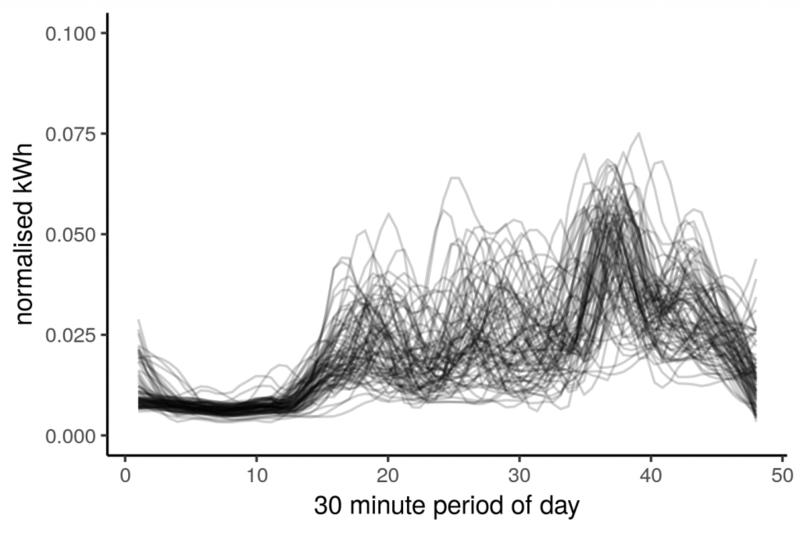 In this blog we’ll go through a methodology for identifying “outlier” days in smart meter data. 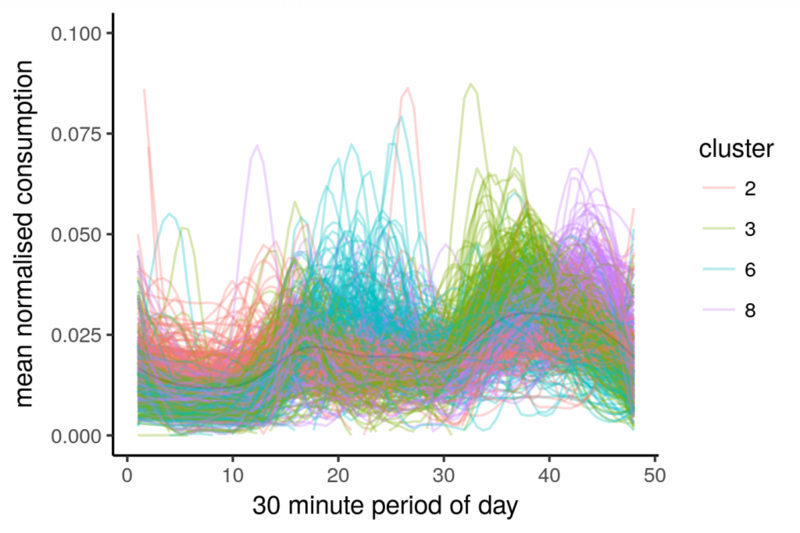 We’ll use k-means clustering to identify outlier days, and filter them out – this gives us a true picture of a houshold’s “typical” consumption. This method assumes that people consume electricity differently when, for example, they sick at home, or that a household consumes no electricity when the occupants are away on holiday. I believe these sorts of assumptions are reasonable. For the case of a two week holiday, imagine a flat-line electricity consumption profile compared against a normal day. The holiday usage forms quite a distinct cluster, however, because it is only present for a couple of weeks, we can discard it. We are then left we the remaining days which will be more representative of the household’s usage. Let’s look at one household’s daily usage profiles. We will normalise it such that the area under each of the lines will equal one. We will also slightly smooth the lines so they are more pleasing to the eye. Let’s see if we can identify some clusters in this profile. We first need to widen our data frame so our clustering algorithm can understand it. 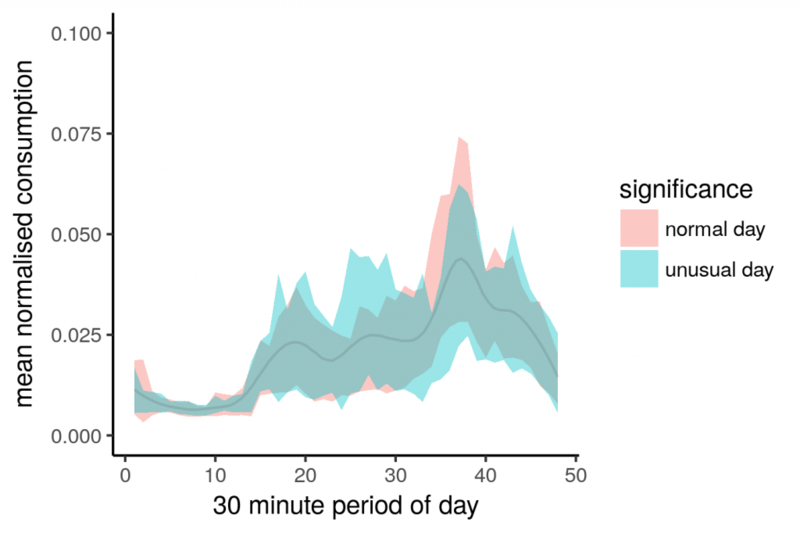 Remember: ggplot likes long data, machine learning needs it wide. 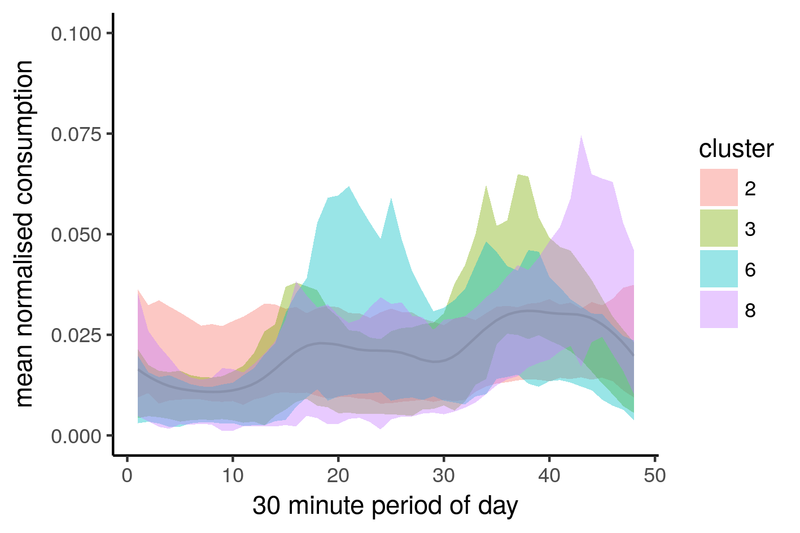 We’ll now have a column for every 30 minute period of the day, and a row for every day. This allows a clustering algorithm to find those periods (columns) amongst the days (rows) that are similar (clustered). 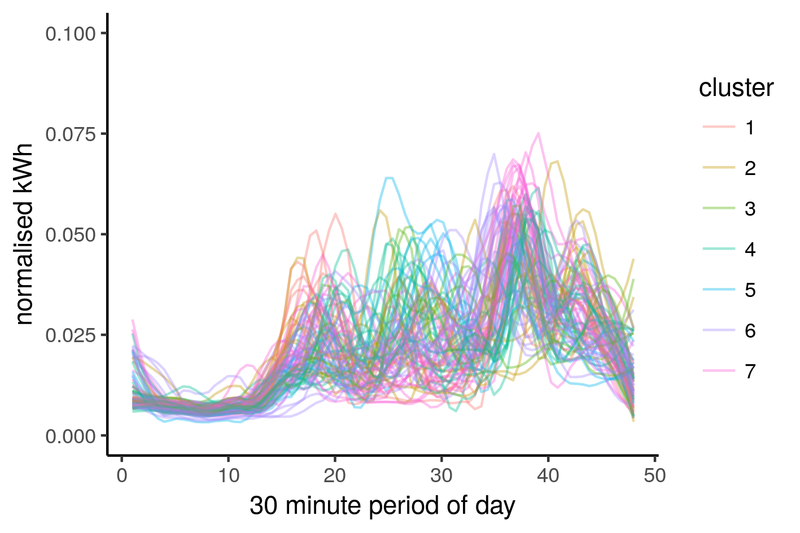 Now we can invoke the base R kmeans clustering algorithm to identify the rubbish outlier days. The filtered or “normal” ribbon is more defined than the “unusual” ribbon, this is what we want. Our filter has essentially kept the red portion and discarded the blue, giving us a more “pure” representation of a househol’d consumption. We can generalise the code by simply applying a for loop, then concatenating the results. This will give us a dataframe containing only filtered household consumption profiles. Then we can apply the k-means clustering algorithm to calculate the overall consumption profiles. Applying k-means to these filtered household energy profiles. We arbitrarily use 10 clusters, we’ll filter out the insignificant clusters. Now for the psychedelic images. These are our main consumption profiles. 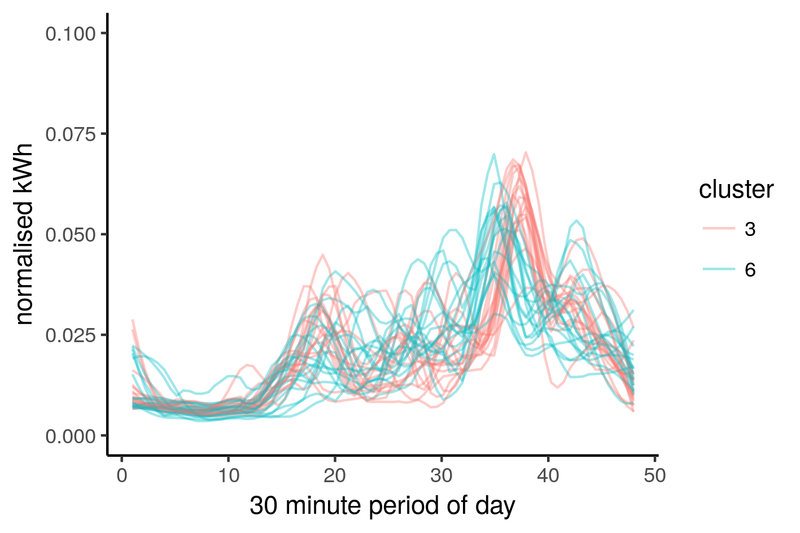 Another less sophisticated method for filtering outlier days is to use the aggregated median of household consumption. I would be interested to hear how this is applied in other contexts. That’s all for today, I hope you enjoyed this post.